You are here: Home » A HARD EARNED AG PODIUM TO HONOR Ghąąjį’!!! A HARD EARNED AG PODIUM TO HONOR Ghąąjį’!!! Ghąąjį’ can be translated as the “Back to back”. This was considered the division of summer and winter. Some have explained that the word comes from the saying Dził bighą́ąjį’ yiidzaaz, the mountains have become snow covered. It was said that when the names of the seasons were being created a Holy Being looked at the mountain and said we would know that summer was ending and winter was beginning by looking to the top of those mountains. The top portion is white because it is covered in snow and the bottom portion is green and yellow because there is still the warmth of summer lingering there. In this fashion the k’eet’aan, offering stick was created. One side would be white and the other yellow. Where the colors meet was the ghąąjį’. There was an order to the seasons and so to the lives of the Diné. The stories of the seasons told the People how to go about their daily activities. For some the cold winds were a whisper telling the People that the Cold People, Hak’az Dine’é were on there way. It was time to harvest and gather wood for the cold days to follow. 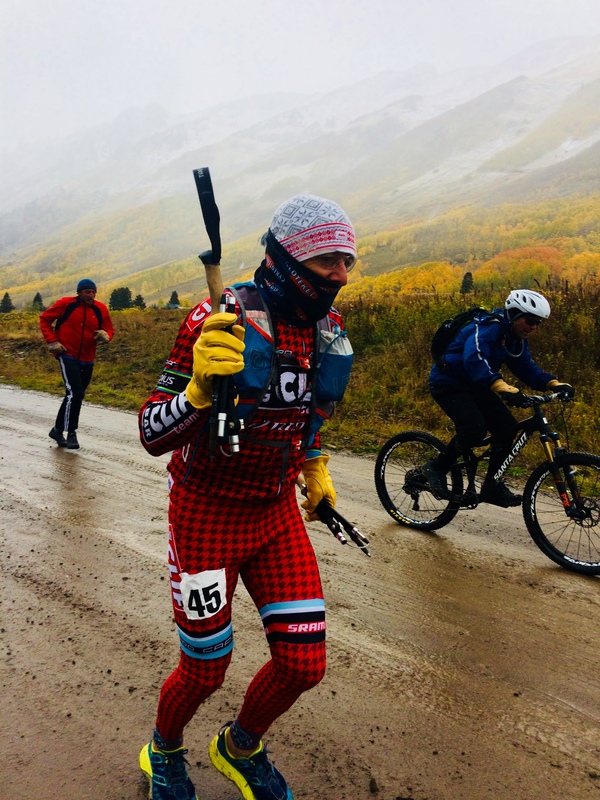 transitioning to what was intended as a pleasant father/daughter recon of SW Colorado’s most authentic true mountain race into a daddy-only race due to hurricane winds and knee-deep snows at the 11,738′ summit. ilg managed a 3rd AG. see the whole video on my FB or IG page. by mile 2 the snow/slush/rock transition required full on Mental Focus. by Timberline, ilg was 17th overall and had my poles out and charging into the raging wind/snow/cold. PERFECT CONDITIONS for ilg! yet? the Race Director could not make it to the summit so, all times/ placings were off due to the intense blizzard on the notorious pass. it’s all GO(O)D tho… cuz? racing is a celebration and today was a celebration of Ghąąjį’ !!! the final 800-meters to the summit? places where ilg had to post-hole BACKWARDS through knee deep snow into the blizzard hard winds ripping. so few really honor the Sacred Snows.